Nice place. We had a great time - What a view. Second time with Great Smoky Cabin rentals. Everything was better than expected. This cabin is way up the mountain side. Fun driving! Manager Response - Aug 21, 2013: Thank you for your review of Big Timber Lodge. We are happy that you had a great time and the view was better than expected. We look forward to you coming to see us again. My husband and I had a very relaxing weekend despite some unforeseen inclement weather. We had planned on renting a pontoon boat from Almond Boat Dock, but with storm clouds rolling in, we decided to cancel and instead spent the day watching The Great Outdoors and National Lampoon's Vacation while we enjoyed some great food and watching the rain. We didn't mind the weather since it gave us an excuse to cuddle up and celebrate 3 years of marriage with the beauty of the mountains surrounding us. Thank you for providing some excellent movies to keep us entertained on our rainy weekend. "This cabin has everything" This cabin is in a great location, has great views, and wonderful amenities. Impossible to be disappointed with this one. Manager Response - Aug 8, 2013: Thank you, Scott, for taking the time to review Big Timber Lodge. We're so glad that you enjoyed your stay. We appreciate your repeat business and are glad that you enjoyed he location, views, and amenities. This place is absolutely AMAZING! The night before we left. I called to ask what type of camping we'd be doing. I didn't know whether to pack extra toilet paper, a bowie knife, a fishing pole, or a pair of high heels! So because I left a frantic voicemail about what to pack, the Perrinis thought it'd be funny to create a running joke leading me to believe that we'd be staying in a 10x8 room with cracked ceilings and bunk beds, when we pulled up, you can only imagine my shock!! I swear I could not stop muttering, "This is incredible!" for about 20 minutes. 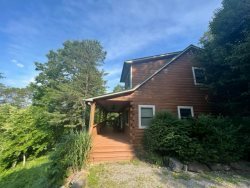 Needless to say, this cabin is absolutely breathtaking with its view and rooms and hot tub and the endless possibilities of things to do here in Bryson City! I can't wait to come back again! Until then, stay sweet Bryson City! We had an incredible time! Thank you so much for sharing this awesome getaway. Other than not having internet due to some problem with the service, it was by far the best vacation we have had. We checked out the Newfound Gap, hiked the AT, rafted at NOC, hiked up the insanely steep paved trail to Clingman's Dome, and rented a wonderful 75 hp pontoon boat from Almond Boat Park for a beautiful drive to Fontana Dam and back. Pure Bliss. We had an incredible time! Thank you so much for sharing this awesome getaway. Other than not having internet due to some problem with the service,it was by far the best vacation we have had. We checked out the Newfound Gap, hiked the AT, rafted at NOC, hiked up the insanely steep paved trail to Clingman's Dome, and rented a wonderful 75 hp pontoon boat from Almond Boat Park for a beautiful drive to Fontana Dam and back. Pure Bliss. We usually spend our vacation at the beach, so this was our first time vacationing in a mountain cabin. Wow, was it relaxing! Your cabin has a perfect floor plan for spending quality time with the family, and is decorated so tastefully. We genuinely enjoyed our stay. We enjoyed the spectacular view; playing board games on the deck and around the coffee table; roasting marshmallows in the outside fire pit; hiking and biking around the community; cooking on the grill and eating pork chops, hamburgers, and veggies; and searching and finding the viewing tower at Clingman's Dome from the deck. Your flowers along the driveway are beautiful. We enjoyed tubing at Deep Creek, hiking and taking pictures in the national park, the view at Clingma's Dome, exploring Bryson City, and eating at Jimmy Mac's and Pasqualino's Italian Restaurant. Had a great time. Great View, Great cabin. Rode Boat on Fontana Lake. Saw Biltmore, Cades Cove and more! Wow! Incredible View. This is the most luxury cabin we have ever stayed at. Im sad we only got to stay for 5 days. We had a magnificent time at Big Timber Lodge! Thank you for the beautiful cabin and view. We will certainly be back at some point in the future! Wow! Incredible View. This is the most luxuious cabin we have ever stayed at. Im sad we only got to stay for 5 days. We had a magnificent time at Big Timber Lodge! Thank you for the beautiful cabin and view. We will certainly be back at some point in the future! Never have I felt as close to God as I have this week! The beautiful view and fresh air, the pure, white snow, the clean smell of the new wood cabin all created the perfect conditions to renew my spirit and cleanse my soul. My husband and his sons built a greater strength in their relationship just before the boys go off to college. This was more than a vacation, it was a turning point in the journey we call life. Thank you for sharing your home so that we could have this experience. We had a wonderful stay in this beautiful cabin. We never stayed here before, but plan to come again. Day 1, we hiked Deep Creek and saw the 3 waterfalls awesome! Day 2, we went to Newfound Gap (not much snow) and then ate at Paula Deens (yummy!). Day 3 , we went to Gatlinburg and tried to go tubing. We left cabin at 7 AM and still couldnt get to tube! Too many people in line so some of us ice-skated. We shipped and did other things. Love the cabin, love the hot tub, view, furniture, everything. "The "Best" experience we ever had" I had been to many entertainment and amusement park and also rented in many holiday locations, out of all those the stay in this place is the best I experienced so far. Only disappointment is that we could only rent for three days at this place. I really wish if it was a 5 days stay and not longer than a week, it may make you to ignore the offerings of this wonderful home if you stay longer I believe. We should always keep the fun in short I believe. One thing we missed in here was any kind of equipment which can give a better view of the hills and valleys around this house, then I would it worth the money we are paying and give a 5/5 rating. We three families had a wonderful time at this location. We went for river rafting in nantahala river, which is just 20 minutes near to this place. There are many other places we can pay a visit and the city is also near by. I would recommend bringing some food item to cook if you would like and do not want to eat outside every time, it might be a bit difficult to eat out every time. I wish if whoever maintains this apartment provide new pillows and comforters more often than what you do. Although it was clean, I felt the pillow cover and comforters were kind of odd and rough. One more it would be better if you could provide a better garbage disposal, while going back we had take some of the garbage with us looking for a disposal area. Manager Response - Dec 28, 2012: Thank you, CTR, for taking the time to review Big Timber Lodge. We appreciate your feedback. We're so glad that you had such a great time in the cabin. We will let the owner know about your suggestion for equipment to enjoy the view around the cabin -- perhaps some binoculars or a telescope. We also appreciate your feedback about the pillows and comforters and again will follow up with the owner about this. Garbage in the mountains is often different than what many guests may be accustomed to at home. Unfortunately, there is no trash pick up service in the area, so we do ask that our guests remove any trash exceeding two 13 gallon bags. There's a map in the cabin for how to get to the local county dump, so we wish you had noticed it. Please keep us in mind for future vacations, as a repeat guest, you will receive a 10% discount off any of our cabins when you call to book. What a fabulous time with my brother and our 2 families for Thanksgiving. We have been trying to get together like this for 6 years and it finally happened and it couldnt have been in a nicer place. We loved this cabin everything was perfect, from the fabulous view, wonderful amenities and convenient layout. I would love to own a place just like this! We spent time in Bryson City and hiked to a waterfall on property my brother owns and checked in on his very rustic cabin. Spent all day Thanksgiving Day just cooking, eating, and spending time together playing games. Friday we drove to Gatlinburg to stay and see the Christmas lights. Unfortunately the weather was wet. Loved making smores in the outside fireplace and enjoying the stars from the hot tub. Hope to come back soon! "wonderful" The cabin was absolutely beautiful, and located conveniently to most area attractions. Our family enjoyed the experience and can't wait to rent again. Manager Response - Jun 1, 2012: Thank you, Dorothy, for taking the time to review Big Timber Lodge. We're glad you and your family enjoyed the cabin and the area attractions. We love the view at Big Timber Lodge of the Great Smoky Mountains and Fontana Lake. As a repeat guest you will receive a 10% discount when you call to book, so when you are ready to rent again, be sure to call us. "Wow!" This cabin is completely awesome! Great floor plan and very livable. The view is something you can never get tired of. We will return here for a getaway sometime real soon! Manager Response - May 16, 2012: Thank you, Ben, for taking the time to review Big Timber Lodge. We appreciate the feedback and your repeat business. Please keep us in mind for future stays and don't forget to call to receive your repeat guest discount. Mystical! You can't beat the views. Leave all your worries behind. Sit and relax on the large patio, enjoy the spa - this is what we did. The house is so well furnished; we loved every minute. We will be back. Manager Response - Apr 13, 2012: Thank you, Peggy, for taking the time to review Big Timber Lodge. We love the views too. We do hope you'll come back -- as a repeat guest, you will receive a 10% discount when you call to book! "Awesome view from awesome house." The house was very comfortable and very roomy. The porch/deck area gave a nice place to drink morning coffee and take in the view. Hot tub in the evening while gazing at stars finished off each day. Short drive to Cherokee, to Natahala Outdoor Center and Bryson City. We enjoyed a visit to the casino, a train ride and a river raft trip. We had a veiw bear sightings while driving through the Smoky Mountains. Beautiful area and a lot more to do than what we had time for. We will be back. Big Timber Lodge was a great place to stay! Manager Response - Apr 20, 2012: Thank you, kslc625, for taking the time to review Big Timber Lodge. We appreciate your feedback and love your photo. Please keep us in mind for future stays. As a repeat guest, you will receive a 10% discount when you call to book.